Sand, scrub, and more sand. Such was the foundation for the Sunset District. A brief history, articles, and photos. San Francisco's Sunset District neighborhoods include Golden Gate Heights, Inner Sunset, Outer Sunset, Parkside, and Parnassus Heights. Sand, scrub, and more sand. Such was the foundation of the Sunset District. The Park and Ocean Railroad line along today’s Lincoln Way began bringing weekend revelers to Ocean Beach in 1883. What the passengers saw to the south was a rolling cold desert of sand. On some maps, the area was described as the "Great Sand Waste." This part of the Outside Lands was added to the city of San Francisco in 1866. An 1868 map created the grid pattern of streets we know today, but while speculators bought lots, until the twentieth century it was almost all undeveloped dunes. Between the 1860s and the 1890s, the Inner Sunset had nothing but a few dairies, ranches, roadhouses, dynamite factories that kept exploding, and an early elementary school. On the west side of today's Golden Gate Heights hills, Carl Larsen had a chicken ranch, and members of the Green family planted eucalyptus trees in today’s Stern Grove. That was about it. Although real estate investors such as Aurelius Buckingham and Sol Getz later tried to claim credit, the Sunset received its name in 1889, when the firm of Easton, Eldridge and Co. marketed land it was selling on the east side of Mount Sutro as "Sunset Heights." Buyers did not rush in. The Olympic Club built an athletics facility on the block between 7th and 8th Avenues along Lincoln Way, but made so little use out of it, that it was abandoned when the lease ended. The 1894 California Midwinter International Exposition held in Golden Gate Park gave the Sunset some life. Newspapers nicknamed the fair site "Sunset City," and establishments such as the Little Shamrock (still serving drinks on Lincoln Way at 9th Avenue) moved in to accommodate the crowds. The Inner Sunset slowly attracted more residences, often only small islands of two or three houses at a time. In the mid 1890s, enterprising bohemian artists created homes at Ocean Beach out of recycled horsecars and cablecars, naming the community "Carville." (More "respectable" residents of the Carville area soon called it "Oceanside.") 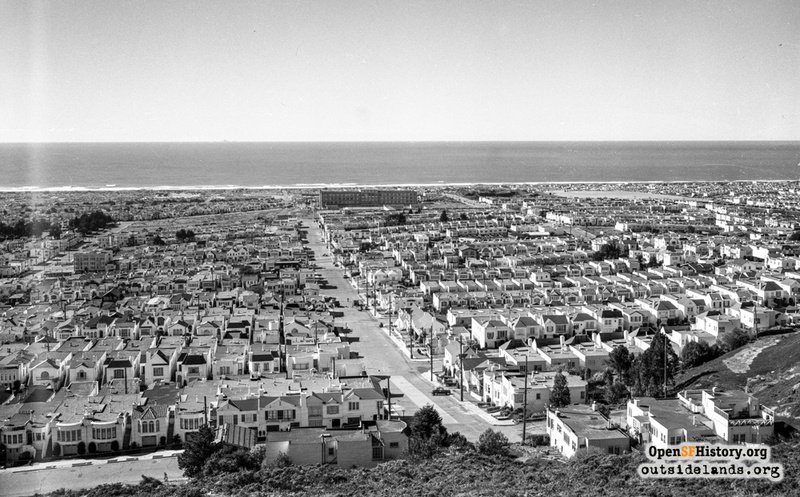 In 1905, William Crocker's realty company began the first large housing development on the western edge with Parkside, built up around 20th Avenue and Taraval Street. The 1920s and 1930s brought developers such as Ray Galli, the Stoneson Brothers, the Doelger Brothers, and others who took advantage of the availability of new FHA loans to construct row upon row of affordable single-family housing. By shortly after World War II, the sand dune desert had been filled in with a sea of stucco homes.